It can be easy to forget that there’s a lot more to invest in than powerful firearms and the common accessories we attach to them. You can throw down an entire paycheck on the best sights and optics, but they’re no good if they aren’t properly installed. They’re also no good if a piece goes flying off while you’re shooting! If you’ve purchased the coolest looking Glock sights, you’ll also need to purchase a front sight tool and a sight pusher tool. We’ve put together this review of the best Glock sight tools on the market, and we’ll let you know which we think is the best choice for most gunowners. Installing Glock sights, especially the rear sights, requires a lot of force. You’ll need to find a sight pusher that will stay firmly mounted on a surface, and the cranks and knobs need to be easily turned without slipping. Any falter can result in your Glock or the sights being permanently damaged. Don’t worry, though, we’ve compiled the best of the best for you. Materials – This may be one of the simplest and (let’s be honest) obvious tools for anyone installing sights on their Glock. Raise your hand if you’ve purchased a pair of TruGlo Glock sights and forgot to buy the tools needed to install it in the first place? We have all been there. 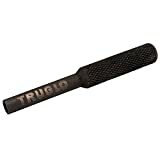 The TruGlo Glock Front Sight Installation Tool is a simple hex wrench in an all black finish. The handled end has a nice gripping pattern on it, so your fingers won’t slip while fastening your front sight tightly. The TruGlo name is stamped on the side, and it weighs less than two ounces. Just be sure to keep it in a safe place for storage, or else you’ll lose this handy tool! Performance – The TruGlo Glock Front Sight Installation Tool may seem like a no brainer, but not all Glock sight kits come with the installation tools needed, and everyone can use a good reminder now and then. While there’s probably not a particularly competitive market for hex wrenches, it’s usually a good idea to stick with the brand you’re purchasing sights from. TruGlo is incredibly common for Glock sights, and buying their tools guarantees they’ll fit properly. We can tell you now that we’re not going to pick this product as “our top pick”, since it’s just common sense to own this type of tooling, but we definitely advise that all of our readers look into picking up TruGlo’s Glock Front Sight Installation Tool. What we say – The TruGlo Glock Front Sight Installation Tool costs less than $10 online. You can’t go wrong with this purchase, and it’s a must-have for anyone installing sights on their Glock. A common sense purchase. No reason to compete. Materials – Now we’re getting into some real products to compare! 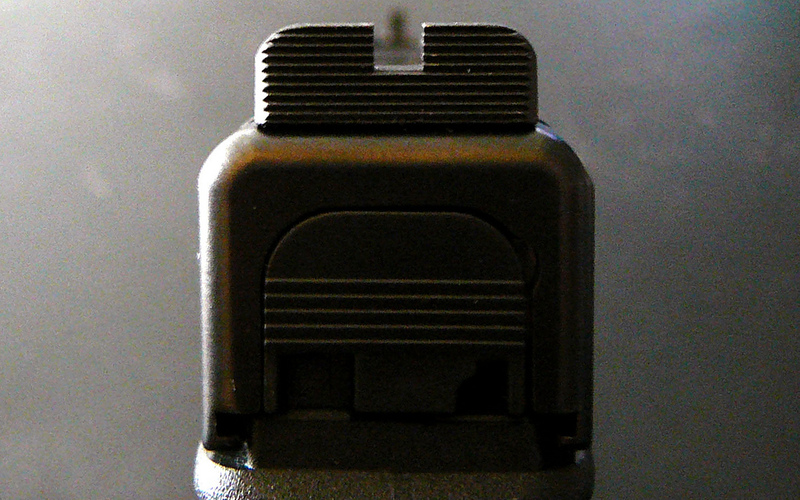 The NcStar Universal Pistol Rear Sight Tool serves as a fantastic Glock rear sight pusher. You’ll never have to worry about damaging your sights or your Glocks again with improper tooling. This rear sight tool is a standalone construction, and it can perform multiple tasks: installing rear sights, removing them, and adjusting for windage of dovetailed rear sights for nearly all semi-automatic pistol slides. That’s right, just about any handgun will fit with the NcStar Universal Pistol Rear Sight Tool. Simple knobs are the perfect size for gripping to secure your Glock in place. A metal crank is easy to manipulate for installing your rear sights. Plus, this Glock sight pusher comes in a fun, blue color. Why not? Performance – We actually really like the NcStar Universal Pistol Rear Sight Tool. This is another product that doesn’t experience too much competition, but there is a little more to consider before purchasing any old Glock sight tool. Practically every part of this construction is visible, so you can catch right away if something was placed at a weird angle or the cranks aren’t lining up correctly. It’s easy enough for just about anyone to use. We do wish that there was some type of padding within the sight tool to avoid scratching our pistols; although, there is some minimal padding. We also noticed that this model is a little lighter than others we’ve used, and that can become a problem for some. 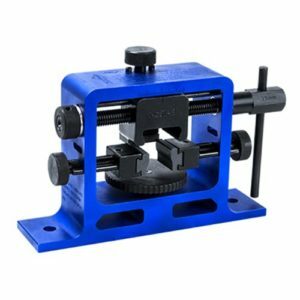 What we say – The NcStar Universal Pistol Rear Sight Tool costs about $45 online, which is a great price. It would be tough to find another Glock sight pusher of similar quality at that price. 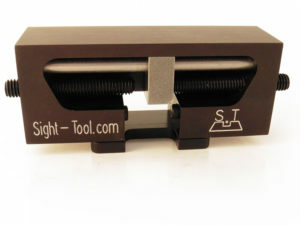 Materials – The Sight-Tool Universal Handgun Sight Pusher Tool is made up of a billet aluminum body with a steel pusher. This company is all about “made in America”, so you can count on every manufactured piece being produced in the United States. This Glock sight pusher can be used for both front and rear sights, and the entire product is significantly more heavy than many others on the market. While you may need additional weight to install sights while using other sight pushers, you won’t need anything extra while using this model. The Sight-Tool.com Universal Handgun Sight Pusher Tool grips all four sides of the slide, so nothing will budge a single millimeter during installation. This model is also universal, and it’s bigger than the average sight pusher. Use it on your Glock or any other pistol that needs a pair of sights! Performance – The makers of the Sight-Tool.com Universal Handgun Sight Pusher Tool are very interested in providing a unique tool that stands apart from all the others. The size and weight of this Glock sight pusher is definitely noticeable. You will want to store it out of the way, when it is not in use. Its function is pristine – we tested this guy out multiple times in a row, and it didn’t fail us at any point. For a lot of our readers, having a product that is entirely made in America is very important. If that is important to you, then you won’t have to bat an eye while purchasing this product. It may take up a bit more space and weight a little more, but the Sight-Tool.com Universal Handgun Sight Pusher Tool is a wonderful investment to make. What we say – The Sight-Tool Universal Handgun Sight Pusher Tool costs about $80 online. We find this price to be very reasonable, and you can expect this tool to get the job done every single time. Materials – The Trijicon GL02 Night Sight Installation Tool Kit for Glock Models is one of the only sight pushers made specifically for Glocks, so you won’t have to worry about a proper fit. Instead of claiming to be “universal”, you won’t have to question if it will work with this or that pistol. This kit comes with both the Glock rear sight pusher as well as the front sight hex screw set. The hex screw set has a screwdriver on one end and the hex wrench on the other, and the middle section has a texture surface for keeping your grip while using it. The design is incredibly simple, so anyone can use it, and it comes in all black. Performance – For the Glocks and sights that the Trijicon GL02 Night Sight Installation Tool Kit fits, it works very well. That being said, there are a lot of limitations on this one. While there are no questions asked on which handguns will work with this sight pusher, it only fits Glocks, and it won’t fit any 42 or 43 models. It also only works with two sight sets: the Trijicon Bright and Tough set and the HD Night Sight set. At the same time, if you own a Glock with any of these sights, you can feel confident knowing you have a tool that was made specifically for those items, and it should work astutely. The hex screw tool for front sights is a handy little addition, and we believe you could use this tool a little more freely with other sights. What we say – The Trijicon GL02 Night Sight Installation Tool Kit for Glock Models cost just under $140 online. This is significantly more expensive than other Glock sight tools we’ve found, but you’re getting the Trijicon brand name with highly professional craftmanship. Our top pick for the best Glock sight tool definitely goes to the Sight-Tool Universal Handgun Sight Pusher Tool. For one, there are little to no complaints about this product. The brand has made a serious effort to stand apart from other sight pushers, and it has succeeded in that. Despite the heavier weight and larger size, those attributes seem to be a little necessary for the type of tooling we’re looking at. 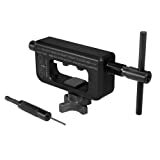 You need a lot of force and stability for installing Glock sights, and the Sight-Tool.com Universal Handgun Sight Pusher Tool can achieve that. Simply shell out the $10 for a front sight screwdriver, and you’re all set for less than $100!